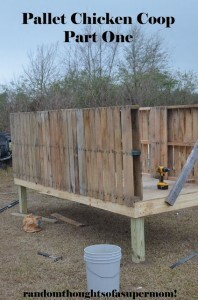 Random Thoughts Of A Super Mom blog shares an idea of making a chicken coop by incorporating found wood pallets. It reduces the cost of materials and builds a self sufficient mind set. Getting the whole family involved is a great way build attachment toward the your homestead, interest in caring for the chicken and spending quality time together.